The Nokia D311 is a multimode radio card that enables you to connect wirelessly to a corporate network or to the Internet. 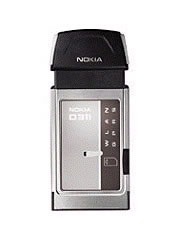 The Nokia D311 is the first Nokia product for the US market that combines GPRS and wireless LAN. Nokia D311 WLAN/GPRS PC Card Win2000/XP Driver, and Quicklink Mobile Cingular Wireless Internetet Connection manager. Versions: 3.5.2 (2 Dec 2004).